Can a Colheita be topped off with a younger Port and still be called a Colheita? This is a recurrent theme on the specialized Port Wine forums. Whether you go to For the Love of Port or to The Port Forum, you will find this questions unanswered. Actually, I think there is no answer for this, not from the legal side, neither from the producer’s point of view. Why? On the legal side, IVDP says that a Colheita is a “Port Wine from single harvest”, so 100% of the Port, the total amount from a single vintage. But on the other side, IVDP does not contemplate any evaporation rate for the barrels. However, we all know that anything you age in the wood will evaporate slower or faster. Port Wine in a 550 liters pipa (kind of barrel from the Douro) will evaporate at an annual rate of around 3% (even higher in dryer and hotter cellars), but this evaporation rate is not reduced from the inventory together with the IVDP. 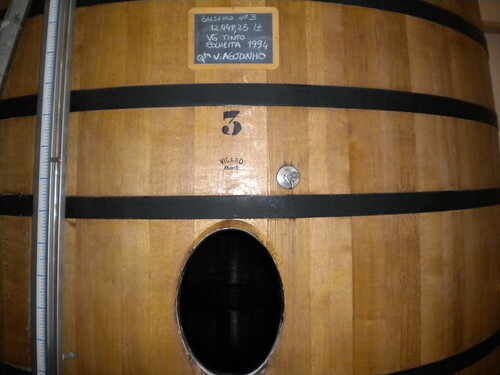 If you declare 550 liters in 1911, and leave it in the pipa from 100 years, in 2011 this pipa will have 27 liters, or 5% of what you had in the year 0. But the figure on your inventory is 550 liters. There is no answer on the legal field. Now lets analyze the winemaking process. Lets imagine we have 10 pipas. We use one for topping off the other 9. At an evaporation rate of 3%, this pipa will last for 4 year. At the end of the 4th year we choose a second pipa to top off the remaining 8. This second pipa will top off the others 8 pipas for 6 years. And so on… (if you are lost, just open the Port bottle and search for something more interesting). Going to the point: is the Port from the topping pipa aging in perfect conditions? I guess no, because as soon as it starts topping other pipas it will not be completely full and this will speed up to fast the oxidation/ aging process. The more it tops off other pipas, the bigger is the amount of oxygen in the topping off pipa. That being said, is logistically hard to top off with the same wine for a long period. On the producer’s point of view, it depends on what you want from the Port: topping off with Port from the same age keeping the same flavor profile or refresh it with younger Port to increase the flavors spectrum. What do we do at Quevedo? It depends on which Port we are talking about. So, can a Colheita be topped off with a younger Port and still be called a Colheita? Yes, it can, and sometimes we do it.